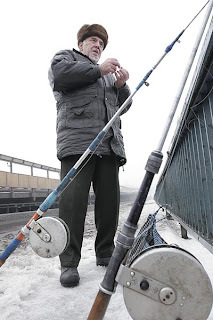 Fisherman Yolya (Leonid) Skripkobski fishes for plotva (carp) from a snowy bridge over the Dnepr river in Kyiv. 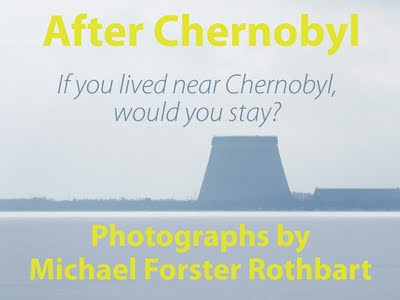 Some people in Kyiv refuse to eat river fish because the city is just 60 miles downstream from the Chernobyl nuclear plant, and contaminated material buried after the 1986 accident continues to leach radionuclides into the groundwater. 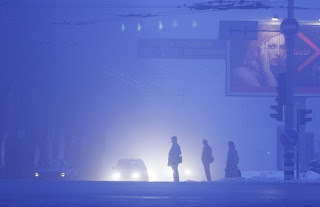 In the pre-dawn fog, commuters enter and exit from the Pechersk Metro station in Kyiv, Ukraine, on a warm winter morning. 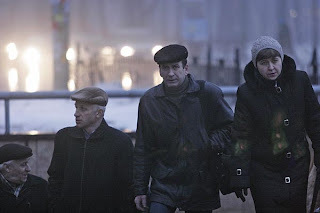 The temperature in Kyiv has been as high as 48 (F) in recent days, well above average. 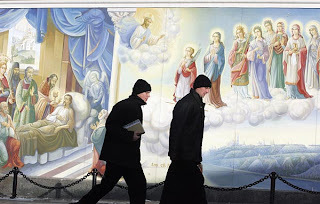 Two monks enter St. Michael’s Monastery in Kyiv, Ukraine, passing in front of a recently refurbished mural. The original monastery at this location was built in the 12th century, but was destroyed in 1937 and rebuilt in 2001.